my pointless: oops. sorry you’re not dead. Last week, beekeeper Jozef Guzy, 76, of Katowice, Poland was stung by a bee and apparently suffered an immediate heart attack. Doctors examined him and pronounced Jozef dead. They put a white sheet over his body and waited for it to be removed. 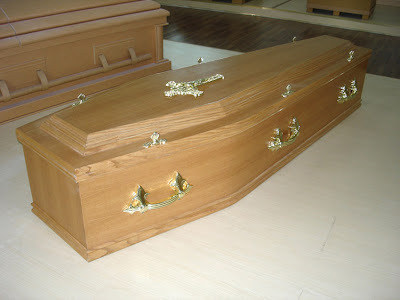 Three hours later, the undertaker came and placed Jozef's body in a coffin. They closed the lid and drove it to a storeroom where it would await burial. His wife Ludmila was devastated. She just could not believe that her husband had died so quickly. Later in the day, undertaker Darius Charon heard some shouting that was "loud enough to wake the dead" coming from the storeroom. It didn't take long for him to figure out which coffin was screaming. Jozef was alive and not-very-dead at all. Mr. Guzy was taken to the hospital and was released a few days later.